Argentina legend arrives in Mexico for new managerial role. 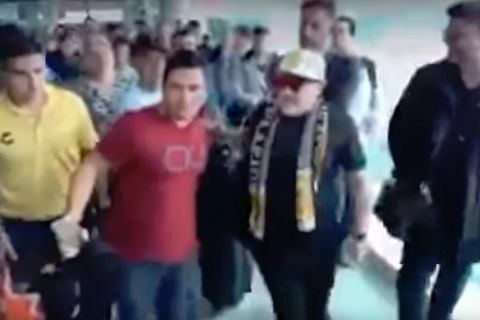 Diego Maradona pushed away a fan who tried to take a photo with him as he was being escorted out of an airport after landing in Mexico. The Argentina legend was unveiled as the new manager of Ascenso MX side Dorados de Sinaloa on Monday. Wearing a hat and scarf branded with the insignia of the Culiacán-based club, Maradona gently shoves aside the man who sidles away when he realises he’s not wanted.